The coalition, which is in line with the larger “No to Napolitano” movement, aims to remove Napolitano from her position and democratize the UC system. The coalition was formed in the beginning of the fall semester by a group of students frustrated with Napolitano’s appointment. Alan Hernandez, a UC Berkeley senior, said the coalition was named after the Students of Color Solidarity Council, an organization involved with the Third World Liberation Front in the 20th century. “We’re continuing a lot the struggles of history and spirit of a lot of the protests that have happened on campus before,” Hernandez said. Throughout the semester, the coalition worked to spread its message via media campaigns and educational outreach, holding regular general meetings from September to October and hosting workshops with different campus student groups. Students in the coalition said Napolitano’s lack of experience in education and her history of deporting millions of immigrants and privatizing institutions while serving as U.S. Secretary of Homeland Security show she is not qualified for the role she holds. UC spokesperson Steve Montiel, however, said that although Napolitano’s lack of education experience makes her an “untraditional” candidate compared to previous UC presidents, it should not affect the academics of the university. Decisions regarding issues such as curriculum changes must go through the UC Academic Senate, he said. He added that chancellors specific to each campus have a more direct role in student life than the president of the university does. Still, UC Berkeley junior and coalition member Patricio Yrarrazaval said that because Napolitano represents fear to many students of color and their communities, her appointment is unacceptable. In November, the coalition interrupted Chancellor Nicholas Dirks’ inauguration to deliver a letter asking for the resignation of Napolitano. The members emphasized the importance of addressing the letter to Dirks rather than Napolitano herself. “We wouldn’t want to ask anything of her, because in a way, that’s legitimizing her position,” said UC Berkeley junior Paulina Olvera. Coalition members communicate with others in the “No to Napolitano” campaign on other campuses, in some cases joining each others’ protests. 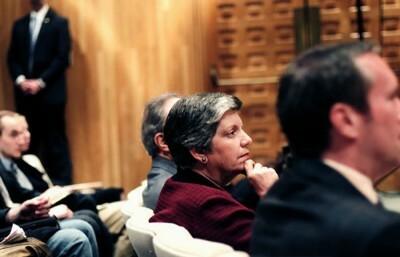 For example, the coalition sent delegates to UC Santa Cruz to protest during Napolitano’s visit in October. A number of protests and rallies also occurred when Napolitano visited other campuses, such as UC Santa Barbara and UC Irvine, where protesters were met with police opposition. On Dec. 2 at UCLA, a protest interrupted a panel discussion on Latina education that Napolitano was part of. Napolitano’s encounters with student protests and criticism, Montiel explained, is not unlike her predecessors’ experiences as president. “University presidents of the UC typically have been lightning rods for criticism for causes or special interests of certain sorts, and President Napolitano is not an exception,” Montiel said. Napolitano has proven to be an “adept and creative leader” in the short period of time that she has been president, he added. 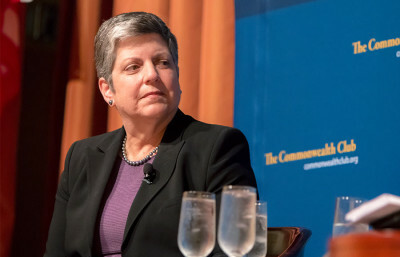 In addition to proposing a tuition freeze at the November meeting of the UC Regents, Napolitano has promised $5 million in aid to undocumented students. 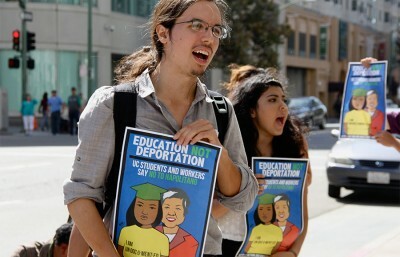 But the coalition members see her initiative as a strategic move to try to “buy protesters off.” Many in the undocumented immigrant community, said UC Berkeley sophomore David Lemus, have been organizing against Napolitano since before her appointment and are committed to seeing to her resign. “Every student who is currently involved believes in the power of a student movement, and when you have a group of students who are committed to fight — in this case, against Napolitano — it’s just a matter of time to get her out,” he said. Contact Tahmina Achekzai at [email protected] and follow her on Twitter @tahminachekzai.